All this relates to “clothes” over the desire. The Torah details how to build these clothes—how to build the right intentions over our desires, meaning the degrees Yod–Hey–Vav–Hey, or degrees of Aviut (thickness, will to receive) 1, 2, 3, and 4. The corrected desires may be from the still (inanimate) such as building the tent of meeting and the ark of the covenant, from the vegetative, such as wool or linen, or from the animate, which are the offerings themselves. The speaking are people who are united in their degree, who wear the clothes that befit the high priest, such as a breastplate, a girdle, a miter, or a tunic. The high priest is a person who is aimed entirely toward bestowal, love of others, through which we reach the Creator. There is a priest, and there is the high priest. That is, there are Katnut (infancy) and Gadlut (adulthood) in this degree. These are the stages by which we must progress in order to correct our desires. The sum of the desire that the Creator created in each of us contains 613 desires, which are 613 desires we must invert from inclining to receive to desiring to bestow upon others. This is how we connect with one another, gathering all these desires into a single mechanism. Can we change desires through intentions? Yes, we can change desires through intentions. By wanting to give to each other we tie our desires as a single body in a Kli (vessel) known as Beit HaMikdash (lit. The House of Holiness; trans. Temple). Bait (house) is a Kli of Kedusha (holiness), bestowal, love of others, the aim to give. This is the Adam that we build, our common soul, Shechina (Divinity), the Assembly of Israel, Malchut of Atzilut—where the Creator appears. The portion explains that our desires are divided, too. The writings of the ARI teach us that our soul consists of Shoresh, Neshama, Guf, Levush, Heichal (root, soul, body, clothing, hall, respectively). Shoresh is inside us, Neshama is our innermost part, Guf is the desires themselves, and Levush and Heichal are additions. The Torah tells us that the Levush (clothing) consists of the five types of garments of the high priest. Heichal (hall) is the surroundings—the tent of meeting with all its details. Of course, none of this relates to any physical tent, person, vessels, or a lamp. Rather, the text relates to the way we develop the will to receive into working in order to bestow, as the Creator bestows upon us. Through these corrections of many degrees and parts in our desires we achieve similarity with the Creator and Dvekut (adhesion) with Him. Aaron and his sons are all in spirituality, yet we know that spirituality is not transferred by inheritance. Many Kabbalists had no children, or had children who did not become Kabbalists. And yet, here we see a very clear order of Aaron and his sons. What is the meaning of this order? The priesthood that is passed on from father to sons is discussed not only in this portion. Some researchers claim that it is possible to find genes of priests even today. Is a son the next degree of the priest? Yes. This is why it is impossible for a holy Partzuf to emerge from a Partzuf that is not bestowing in order to bestow or receiving in order to bestow. In our world we may or may not pay attention to it because in projecting to corporeality it becomes mere customs. But in spirituality we understand where it comes from; a Partzuf that has a Masach (screen), Aviut (thickness), and Ohr Hozer (Reflected Light), and works in holiness cannot yield an impure act. This is why priesthood is inherited from father to son. How come we do not know what happened to Moses’ sons, but do know it about priests? Moses is contact with the Creator, in which all are included, above all the priesthood. The priests provide direction in the work of the Creator, in corrections, and Moses is the point of contact itself. It is not a direction, merely a point of attachment, of Dvekut. In other words, it is all in us; it is not a physical Moses or anything of the sort. No, there is no such thing; it is all in us. When we connect among us, we produce a Kli that yields a sensation of connection, a bonding between us. First comes love of people, as it is written, “love your neighbor as yourself.” Then comes the love of the Creator. These are the circles we need to build in the bonding between us. The whole of humanity must achieve it, the people of Israel, as well as non-Jews who are drawn to it and can achieve real connection with the Creator. This is why Moses did not belong to the priests, Levites, or Israel; he is a point above any definition. Although he includes them, he is still above them. The correction of the world is that all of us will unite. The more we unite and make ourselves similar to the upper light, the Creator, the more He is with us and within us. The portion details garments. It was said that only the wisehearted can prepare these garments. Who are the wisehearted? The wisehearted are those whose heart, meaning desire, is arranged according to Hochma (wisdom). These are not ordinary desires, but ones that have been arranged by the light of Hochma. Therefore, the beginning of the portion talks about the general light that reforms, which illuminates all the Kelim (vessels). Only with this light is it possible to carry out the Mitzvot (commandments) described in the portion, which is why it is called Tetzaveh (Command). The Creator’s command comes only in order to give us the light that reforms. The Creator tells us how to use it in order to achieve corrections, such as the garments of the high priest, the building of the tabernacle and everything else. Is it only when a person reaches a certain stage of wisdom of the heart that one can wear these garments? The heart is the tabernacle of all our desires, but only if one arranges all of one’s desires in the right order using the upper light, the menorah that illuminates to that person, the light that reforms. The right order means in order to bestow, from easiest to hardest. It is not something we need to build; it is rather built by itself. The commandment relates only to our willingness; we must come under the light with our Kli, then the Kli will acquire the shape of the light. The wisehearted do not know how to do everything, only how to prepare themselves for the light to work on them. Why is the engagement with garments possible only from this point onward? Clothing is the intentions to bestow. So are the wisehearted intentions? The wisehearted are those who prepare themselves for correction. When it comes, it brings them garments. When it writes, “And you,” it means to include Divinity in the command and in the speech. 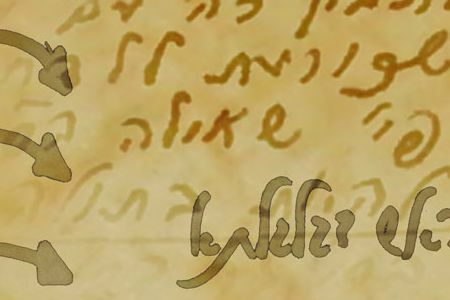 The upper light, ZA, and the bottom light, Nukva, are included together in the word, “And you,” since “you” is the name of the Nukva, and the added Vav [“and”] is ZA, as it is written, “And You preserve them all,” relating to ZA and Nukva. Zeir Anpin is the Creator, the upper force, the light that reaches us. We who want to connect build the Nukva. Although she herself does not exist, this part was left after the breaking. The soul has broken and its pieces are scattered. As much as we may want to connect, we cannot. However, we have the tendency toward it, and accordingly, the light affects us and connects us. If there is additional inclination, additional light influences us and connects us. This is why our work is called “day-to-day,” as in “Day to day pours forth speech” (Psalms, 19:3). This is how we arrive at the end of the year, the Day of Atonement that connects us and leads us to all the corrections. This is when we atone for our iniquities. Yet, these are not our own iniquities. Rather, it is the breaking; from the time of the breaking of Adam HaRishon, before we were created, since “the inclination in a man’s heart is evil from his youth” (Genesis, 8:21). When we scrutinize these matters and want to overcome them and connect above all gaps and hatred, and achieve love, we reach the foot of Mount Sinai. Why is Yom Kippur (Day of Atonement) considered the holiest day? It is the point of contact of all the desires that one has prepared to connect with everyone into a single Kli to be in Dvekut with the Creator. That is, it is the implementation of our work in this world, in which we must achieve the revelation of the Creator, unity, and love of others. Yom Kippur symbolizes it. Is it a specific day in the year? No, a day is a degree. If a person performs all the corrections, the degree that one reaches is called Yom Kippur. It could happen on any of the days in the year because it is not a day but a spiritual state. What is so special about this day that only the quality known as the “high priest” makes the required correction in the Holy of Holies? A person adds all the corrections on the still, vegetative, animate, and speaking levels in their final form and achieves Dvekut. It has to be “world,” “year,” “soul,” and “place.” That is, a person arranges all the desires—still, vegetative, and animate—the clothes, which are also the cover of the tent, all of one’s garments from the vegetative. The animate are the offerings of Yom Kippur. The high priest is a result of the whole of humanity, from all the corrections on the human, speaking level. If a person joins them all together on the special day called Yom Kippur, it brings one to the point of Dvekut with the Creator. This is the highest place that can be achieved, from which one achieves the end of correction and rises to a higher dimension. Thus, “Serve the Lord with gladness,” since man’s joy draws another joy, the higher one. Similarly, the lower world, Malchut, as it is crowned, so it extends from above. This is why Israel hurry to awaken a sound in the Shofar, which includes fire, wind, and water, the middle line, which consists of three lines that became one and rises upwards. The three lines talk about the work of the priests—Priest, Levite, and Israel—meaning about our work. There are two Klipot (shell/peels): the Klipa (singular for Klipot) of the right, which is Ishmael, and the Klipa of the left, being Esau. Right and left are our work, our will to receive opposite which is the desire to bestow, and the extent to which we can add these desires by removing the Klipot Ishmael and Esau. This is how we build the middle line, the line of Dvekut, called Adam. On this line, the more we connect among us all the desires, all our intentions in order to achieve similarity with the Creator, bestowal and love of others—and from there to the love of the Creator—the more we ascend in our connection. If we achieve unity in that line, we have reached the purpose of creation. We must understand that the current changes the world is going through, the myriad problems, the global crisis, are all signs we must begin to connect, since only by that will we be able to resolve the crisis. The Creator sounds like a forceful, domineering force, while the creature is in a state of constant sin and request for forgiveness. It is a rather complicated system. For what should one ask forgiveness? If it is written, “I have created the evil inclination,” then the Creator has created it. What then is there to ask forgiveness for? On the contrary, we should demand, “I want You to correct what You have created in me.” It is called, “My sons defeated Me.” The Creator will welcome it. We misconstrue the Torah by thinking that we are sinners, while the sin is not in us. Our only sin is not requesting correction. What is in us did not come from us; we cannot blame ourselves for how we were born. We should say in regard to all our qualities, characters, and all that we are, “Go to the craftsman who made me.” We are not to blame. The fault, the blemish, is that we do not examine ourselves and ask for correction so as to be similar to the Creator—bestowing, loving others, benevolent. When a person does not reveal and does not ask for correction, this is when one is at fault. However, we did not commit the transgression for which we have a demand. It is simply something with which to come and demand contact with the Creator, a constant dialog with Him. The evil inclination is “help made against us.” On the one hand, it removes us from the Creator. On the other hand, it gives us an “official approval” to come and connect with Him. Babylonian Talmud, Masechet Taanit, p. 20b..